For some, the holidays are one of the most magical times of year — which also makes it the perfect time to celebrate life milestones, like your wedding day. More brides and grooms-to-be are embracing festive, Christmas-themed wedding ceremonies and receptions. Here are a few ideas to get you started. Winter or Christmas-themed wedding flowers should be truly unique, and the very opposite of spring wedding flowers. Incorporate holly, mistletoe, or poinsettias into floral arrangements and wedding table flowers. Remember, some of the most festive choices also have symbolic meaning. Red carnations symbolize romantic love and Russians used red roses to declare their love, while white typically designates pure love. Keep the theme going with festive pine cones, pine branches, miniature Christmas trees, fake snow, and even stockings. Keep the food and drink menus festive, too. 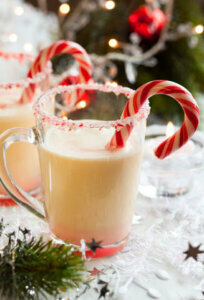 Serve eggnog for adults and hot cider and hot chocolate for non-alcoholic options. If you want to get especially fancy, sparkling cranberry cider, gingerbread cocktails, and vanilla pear cocktails are also great options. Serve with holiday-themed appetizers, foods, and desserts. White chocolate cherries and a hot chocolate bar (with mini marshmallows, chocolate chips, sprinkles, and small Rice Krispy treats) complement festive drinks perfectly. For the best Christmas wedding, keep everything in-theme — and that includes favors, too! Christmas weddings afford couples a rare opportunity: it is actually one of the few times where you can simply hand out customized ornaments as wedding favors. Winter-themed candles, hot chocolate or hot apple cider, and holiday-themed wedding bottle toppers make a great addition to any holiday wedding. Talk to one of the 90,427 wedding florists, online florists, or florists employees about appropriate, festive, and inexpensive wedding flowers and wedding table flowers. Keep the theme going with tasty and festive foods and drinks, and top the evening off with Christmas-themed wedding favors.